Last Updated: 09 Apr 2015. In modern times parents as well as teachers seem to give importance only to studies. This is so because they want their children to become either engineers or doctors. They do not think that development of a sound body is needed. They tend to forget that all study and no play would affect the shaping of the child's personality. It is well known that only a sound body can boast of a sound mind. To fulfill this, sports should be included in school curriculum. It is a fact that physical training and exercises help to inculcate discipline. Every game or sport has its own set of rules. One has to follow them scrupulously. 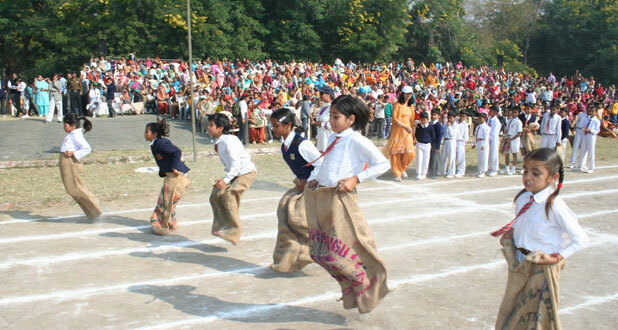 Further, sports and games give the youngsters an opportunity to lead as well as be lead. Thus, sports help to bring out and nurture the qualities of leadership. Vivekananda said that we can reach heaven by playing football than by reading the Gita. What he wanted to stress was the need for physical development. It is a pity that the second highly populated country in the world has never performed well in the sports and games and in athletics. This is because sports have not been given sufficient importance in our education if we want only men with muscles of iron and nerves of steel. It is needless to say that sports should be made a part of school curriculum. Otherwise we could produce only book worms and not world champions. By Solanki pratik / In Rajkot.. According to my point of view, sports has to be the part of the curriculun in the school. That has many advantage of them, sports is very helpfull in studying also I give you one exmple that if students play game like chess then students first focus that game and try to hold them more time in one place. And students must concentrate that game because without concentration students loose game so students improve that concentration level that will be very much helpful during the studying and learning also. By Tania Samui Dey / In Bangaluru, Karnataka. Sports and its benefits are in itself possess a complete education. By playing different sports activities the student in itself learns the act of fitness along with that he/she acquires the education of self-descipline. Gradually the student will imbibe in himself/herself a motivated instincts which will makeor create a responsible citizen in the near future. By Gayathri KS / In Rasipuram, Tamilnadu. Sports is a word of heaven for students and hell for parents . In our country its given a very least importants some times it is neglected. they want their child shoud be excellent in their acadamic but they doesnt bother about their health childrents are the pillars of the country its not enough those pillars are strong in their brain but also in their health. Sports built their body and refresh their mind it teach them passions and how to take success and losses. Many childrens of our country below the age of 12 or 13 suffering from obesity if we research for reason its because of un healthy food hait and lack or nil in physical exercise. At my last point i would like to add that allow the children to play and give equal importants to sports then only the child can become a complete man. By Sonali Ganguly / In Bargarh, Odisha. Our focus should be always upon the complete development of a child which education alone could never provide. education no doubt can give birth to an impressive brain but still something lacks. That is the complete physical development of a child which is often neglected. Health is the most precious property gifted to us by divine. It needs proper nourishment through health education which is essential for the complete growth and development of a child. It is the way to give relaxation to both body and mind- the day to day busy study schedule has made the students somehow equivalent to machine who just follow a routine without any deviation. constant study also makes it monotonous. the school curriculum should be prepared in such a way that a student get sufficient time to play. May it be some innovative games which help in their mental growth or may it be some outdoor games where they can feel free to enjoy all their time in playing. Proper guidance could be given to them by the teachers. It would not only serve the purpose of refreshment for them but also would make them more active, increasing their concentration level. We can expect complete development only when both physical and mental development takes place simultaneously.